I've always prided myself on being able to come up with dinner when the cupboard is seemingly bare, so I decided to give myself a "Doorknock Dinner" challenge. A few years ago, the Food Network aired a show call Doorknock Dinners which featured Gordon Elliot taking a guest chef (or himself) into the home of a usually busy person and cooking them a dinner by using only the ingredients they had in their home. This was the show that brought my favorite TV cook, Paula Deen, to fame. It was a few weeks ago. I hadn't been to the grocery store. Money was a little tight that week, and I only had a few random things in the pantry. 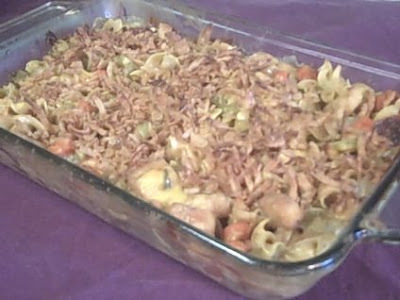 I started throwing things into a pan and before I knew it, I had a fabulous casserole! I used alot of the usual stuffing ingredients, but I added some egg noodles to it and turned it into a dish that easily stands on its own. Gordon and Paula would be so impressed! Roughly chop carrots, celery, and onion. In a large skillet, heat a tablespoon or two of olive oil. Saute the vegetables over a medium heat until almost tender. Add a good amount of poultry seasoning along with the salt and pepper and saute a minute or two more, until the spices are infused. In a large mixing bowl, add sauteed vegetables, uncooked egg noodles, croutons, soup, and milk. Stir well. Pour into a greased 9x13 casserole dish. Sprinkle with shredded Velveeta cheese. Bake for about 30-40 minutes, or until noodles are tender. Sprinkle with French fried onion rings. Bake for 5 minutes longer. Add anything you want to the veggies as you saute......mushrooms, sugar snap peas, broccoli, whatever you like! Buy a rotisserie chicken, and add the shredded meat to the casserole just before you bake it. Yum!